My Eyes!!! I can’t ever unsee some of that! I have a gift/curse of seeing everything around me it seems. I am known as the OSHA supervisor of my family. I am always looking at what could go wrong with any situation, and I try to avoid the risks. Our friends joke that I don’t let my kids eat with forks due to the danger. I joked with them last week that we’ve moved onto sporks, but the weak almost bendable type! I attribute my noticing everything partially to just who I am, and partially from risk management classes during college. Always be aware of what could go wrong, and prepare for it. 1. Woman defecating in the parking lot in front of Toys R Us. This past Saturday, I was working, and in between visits to care homes, I stopped at Michaels to pick up some more supplies and to eat my lunch while sitting in my car in the parking lot. As I was pulling into the shopping center parking lot, I noticed a woman walking on the sidewalk that was walking unsteady, and was overall disheveled. As I parked my car and started eating my lunch, I noticed the woman had turned into the parking lot. As I stared out of my front window blankly letting my mind wander, I noticed her stop in a row that had dirt on the inside, pull down her pants, squat, and start going to the bathroom. At this point, my head went back and forth, scanning the area to see if there was ANYONE ELSE that was seeing this! CARS DROVE BY HER! I watched the drivers, no one seemed to pay much attention to the woman squatted and pooping 2 feet from where their car was driving by!!! I scanned my eyes more, and noticed a security guard, shooting the breeze while smoking with another guy, and it just so happened he was sitting on a shopping cart rail where a van was blocking his view of the woman pooping about 100 feet from him. WHAT. THE. HELL. She got up, pulled up her pants, and carried on. It was like I was getting Punked. It was also clearly not her first time doing this, because she didn’t miss a beat. Needless to say, my grocery store sushi roll did not get eaten. 2. Guy tying off his arm in two places whereas what I would assume to be in order to shoot up. Then the questions came from the 3 kids in the backseat. Lovely conversation that I never thought I’d have to have, about something I never expected to see. 3. Older man’s pre-batting softball ritual. Again, I was very thankful that this next one was witnessed by another person. A friend who I will be able to text throughout life without needing much explanation as a description of this event. Our husbands play on a softball team together. A player from the other team got up to bat, approached the plate, and put the bat between his legs, and motioned it back and forth about 7 times before assuming his batting stance. But, let’s just say, to be putting it very mildly, it was not A Rod that we were watching. And, it was not raining, nor wet outside. It was about 95 degrees and very dry. 4. Vomit at Disneyland’s World of Color show. He then got out a sprayer, and sprayed the ground, wiped it up with another special towel that he had unwrapped, and quickly shut his briefcase. And just like that, he was gone. I had my head rubbernecked behind me watching the detailed way that vomit was cleaned up at Disneyland for 5 minutes of the show. I can’t tell you what songs played during the show, or what was projected up onto the shooting water. But, I can tell you in detail the vomit clean up process. I looked around often to see if anyone else was watching with me. I even commented to my husband a few times, to which he clearly believed I was crazy to be so interested about the vomit clean up committee. This is a very short list of the type of things I notice on an almost daily basis. It’s a gift and a curse to see so many things that others may not. And even though it’s most likely due to me being nervous and anxious that I am constantly casing my surroundings, at least I have some good stories! 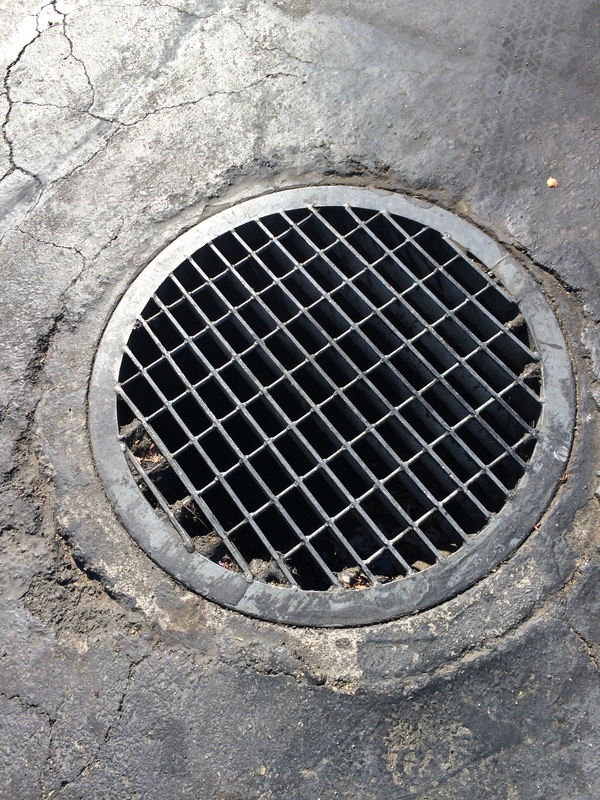 I have an irrational, obsessive fear of elevator shafts and street drains. I’m not scared of an elevator falling to the bottom floor as you may think is my fear regarding elevators. I’m afraid of that little spot between the floor, and the elevator. The slat that is a perfect spot, that if my keys fell, it would be a fiasco to try and get them back. There is not a time, not once, that I step onto an elevator and I don’t think about that hole, and my keys falling into it. I then go through the steps in my mind that I believe would be how to get them back. This is what I’ve come up with. If we’re at a large building, say a casino, there are people that work there all over, I believe I could find the right person to lead me down to what I picture as a basement with a burning stove, where in movies, it’s creepy and murders take place. BUT, there would be my keys, sitting at the bottom of the elevator shaft, along with what I would imagine are wallets, money, phones, and other keys belonging to people who hadn’t thought through a plan, and figure their item is gone for good. 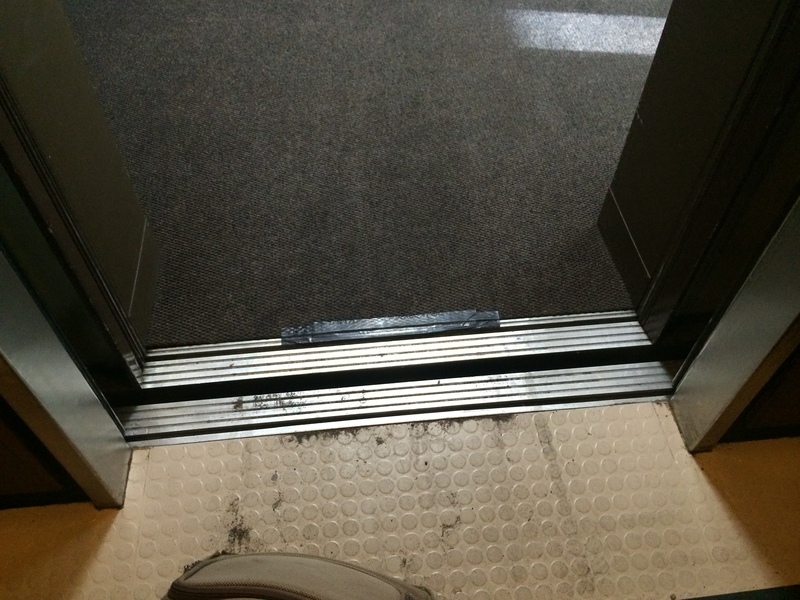 IF, it is a small elevator, in say, a small apartment complex. I figure I’m pretty screwed. It’s going to take a long while to get someone who knows where to go and what to do to get me my keys that fell down the hole. But, if I can get the keys to the bottom elevator floor room, I’m pretty sure I’d have the situation locked down. I’ve thought it through in my mind so many times, I’m pretty sure I’ve come up with all possible solutions. So, as I think through my plan of action each and every time I get on or off of an elevator, you can look closely, and will see that I am distracted in my thoughts of where exactly my keys are. If they are in my purse, and there is any possible way that they can fall out and land perfectly as to slide down that crack into the elevator dungeon, I’m double checking that my purse is securely closed, possibly checking multiple times. If my keys or phone are in my hand, there is a death grip on them. My husband was with me when I took the picture above of the floor in front of the elevator. He said “What are you doing?” I told him that I was taking a picture because I may write a post on how I’m scared that my keys will fall down the elevator shaft through the slot between the floor and the elevator. His reply? “Alright.” Really, no skin off his back, this isn’t his first rodeo with me and my crazy thoughts, he knows there is no reason to question further. Moving on to street drains. As if the elevator wasn’t enough to worry about, there are street drains. These pose an entire different threat. Some, I don’t get too incredibly worried about, because you can see the bottom. Yet, on a rainy day, that bit of comfort is totally gone. Once those keys hit the flowing water downhill, they are gone. And really, I have no plan for that one. As well as the large drains where you can’t see the ground. No plan other than calling the City Utility district and maybe making up a story that the keys belonged to the limo of a top government official or something so that maybe they would come and help me look for them. And what about this sign that often accompanies a street drain? It makes this whole process even harder to handle. Really? 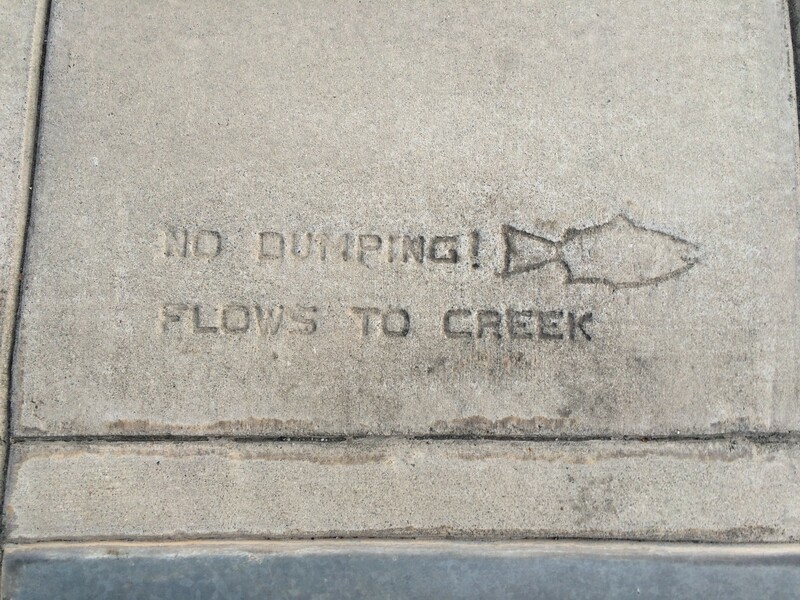 A creek? I’m never getting my keys back, ever. Street drains. I have to hold my keys even tighter in my hands then when I’m walking onto an elevator. Some of these drains seem large enough for my whole wallet to fall through. I will avoid walking directly over them at all costs. Good Lord. I let out what I imagine would be described as a loud gasp, like, I just missed getting hit by a dart or something. Thankfully, my keys and phone were tucked away in my pockets, where they were not threatened by this unexpected drain. I can pretty much guarantee that I will never park in that spot at Target again for as long as I live. I think it’s safe to assume that you would not be surprised at this point to know that each and every time that I take off a ring or earrings near a sink, that I mentally go through the steps of taking apart the pipes below to rescue any fallen jewelry. I find comfort in having a plan. And, there you have it. My brain. It’s never boring in there, there’s always something that I can find to worry about! OH MY GOSH! After I wrote this, I googled ‘my keys fell down the elevator shaft’, and this came up! And after the conversations with my children are done, I then start telling myself the same things. Man, this worrying about your kids thing just gets harder and harder with some of the things growing older presents. There were times in my life that I couldn’t see around the moment I was in in order to see the possibilities of the future. And only through living life have I learned, that it really is better in 5 minutes, and the second day is usually easier than the first. As school starts tomorrow, and I look into my crystal ball and see myself waking up repeatedly throughout tonights sleep, I will tell myself as I often do in the middle of the night ‘everything is ok’ and allow myself to go back to sleep. With the first day of school comes the enjoyment of a routine (and a quiet house), which will only too soon be replaced with missing the kids and wishing for summer to return quickly! Here’s to a safe school year, and strength to all of the wonderful teachers that spend each day teaching our kids!